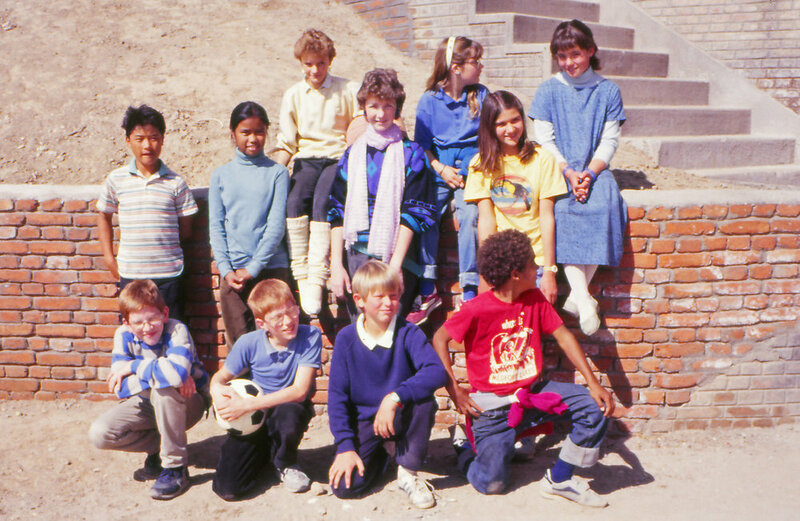 KISC was established by United Mission to Nepal (UMN) and International Nepal Fellowship (INF) on February 2, 1987 at a rented site in Jorpati to meet the education needs of the children of the missionaries. Alan McIlhenny, who was teaching maths in Pokhara, Nepal researched the concept of an international study centre and wrote a PhD dissertation at the University of Surrey before returning to Nepal to establish KISC in 1987. The earlier study system at KISC included self-study programmes from the students’ home countries, except French, Dutch and Indian students, who used materials from the United Kingdom. This system provided the students and their parents with the flexibility of where and when to study. Students could attend KISC part-time or full-time, either as day students or boarders. By the second year the school had grown from 7 students to 20. As the school grew, it changed from a self-study centre to a more traditional school. Two KISC students - Andrew McGall and Sarah Morris, took GCSE exams for the first time in the school’s history in November 1988. In 1995, the school moved from Jorpati to another rented site in Satdobato. Bob Bickerdike was the new principal. The school moved for the second time to another rented site in Naya Baneshwar in July 1998. The McIlhenny Shield, honouring the KISC founder Alan and his wife Margaret, was presented for the first time during academic year 1998-1999 to the house that obtained the maximum points in all inter-house competitions. The school received its first Middle School Association (MSA, American) accreditation in 2003. With the desire to pass on KISC’s high standard of education to others in Nepal, the school started a teacher training programme to help transform Nepali education. The school moved to its new site in Jawalakhel in January 2006. Also, KISC Primary began in August 2006. The site used to be the Norwegian Embassy, and provided the school with much needed space for a primary school as well as a football field. In October 2007, KISC went through a major change when UMN and INF handed over the ownership of the school to Human Development Community Services, a Nepali Christian NGO. Partnership with HDCS provided KISC with an opportunity to positively impact the Nepali school communities across the nation through its teacher training programme. On December 2007, the KISC community found its current home at Dhobighat. KISC's teacher training programme was officially named as EQUIP (Education Quality Improvement Programme). KISC is the only K-13 international school in Nepal with both Middle State Association (MSA, American) and Cambridge International Examinations (UK) accreditations. We are a culturally diverse community with over 30 different nationalities represented by 200+ students and staff. KISC EQUIP continues to work with around 30 government, community and private schools in rural and urban areas of Nepal.